Dietary fatty acids are the main building blocks for cell membranes in animals, and mechanisms must therefore exist that compensate for dietary variations. We isolated C. elegans mutants that improved tolerance to dietary saturated fat in a sensitized genetic background, including eight alleles of the novel gene fld-1 that encodes a homolog of the human TLCD1 and TLCD2 transmembrane proteins. FLD-1 is localized on plasma membranes and acts by limiting the levels of highly membrane-fluidizing long-chain polyunsaturated fatty acid-containing phospholipids. Human TLCD1/2 also regulate membrane fluidity by limiting the levels of polyunsaturated fatty acid-containing membrane phospholipids. 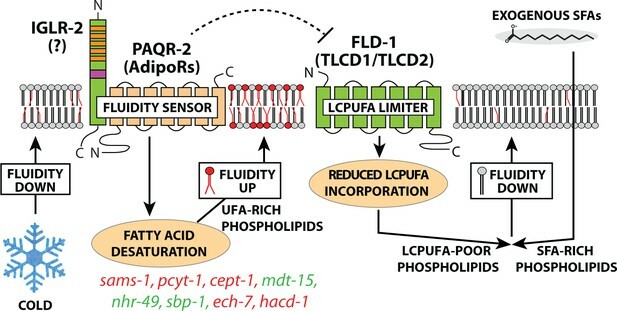 FLD-1 and TLCD1/2 do not regulate the synthesis of long-chain polyunsaturated fatty acids but rather limit their incorporation into phospholipids. We conclude that inhibition of FLD-1 or TLCD1/2 prevents lipotoxicity by allowing increased levels of membrane phospholipids that contain fluidizing long-chain polyunsaturated fatty acids. The saying “you are what you eat” is probably closest to the truth when talking about fats. This is because the outer edge of our cells, known as the cell membrane, is built mostly from the fats found in our diet. Yet, there is a possible problem with this situation. Based on their chemical make-up, fats can be classed as saturated or unsaturated. Saturated fats, like those in butter, pack closely together and tend to be solid at room temperature. Unsaturated fats, like oils from vegetables and fish, pack together more loosely, making them runny. This means that eating too much saturated fat can cause our cell membranes to become unhealthily rigid, while too much unsaturated fat may make them too fluid. To avoid these problems, cells can manage the fat content of their membranes, even as the diet fluctuates. Certain proteins alert cells when the membrane is too rigid, and the cells respond by converting saturated fats in the membrane into unsaturated fats. Previous research has found a few of these proteins in humans and nematode worms, but it was not clear what would happen if these sensors were not present or not working as they should. Could other proteins monitor the membrane too? To answer this question, Ruiz, Bodhicharla, Svensk et al. took nematode worms that could not make the known sensor proteins and used genetic methods that stop them producing various other proteins too. The mutant worms were then fed a diet rich in saturated fats, and the effect on the fats in the cell membrane was measured. From these experiments, new proteins were found that regulate the composition of fats in cell membranes. In the worms, it turns out that a protein called FLD-1 normally limits the amount of unsaturated fats in the membrane. Stopping the worms from producing this protein made the membrane less rigid. The same applied in human cells with proteins called TLCD1 and TLCD2. More unsaturated fats were incorporated when these two proteins were removed, restoring the membranes to a healthy state despite the cells being grown in the presence of excess saturated fat. Together, these findings suggest that targeting these proteins could potentially lead to new treatments for diseases like diabetes, where cell membranes are too rigid. Membrane homeostasis has been a defining feature of cells since their very origin several billion years ago (Deamer, 2017; Deamer et al., 2002; Monnard and Deamer, 2002). Today we find numerous instances of membrane composition adaptation to environmental conditions such as temperature, pH or pressure across all of life’s diversity (Siliakus et al., 2017; Guschina and Harwood, 2006; Cossins and Macdonald, 1989). Further, the specific composition of subcellular membranes is of paramount importance for many cellular processes ranging from vesicular trafficking to organelle homeostasis and receptor signaling (Holthuis and Menon, 2014). In particular, recent studies suggest important roles for specific polyunsaturated lipids in membrane deformation (Pinot et al., 2014), domain stability (Levental et al., 2016) and membrane fission events (Manni et al., 2018). It is therefore not surprising that many disease states are associated with membrane composition defects. Diabetics, for example, have rigid cellular membranes rich in saturated fatty acids (Borkman et al., 1993; Kröger et al., 2015; Baba et al., 1979; Winocour et al., 1990) that likely contribute to many aspects of the pathophysiology of this disease such as poor microcirculation and impaired insulin signaling (Gianfrancesco et al., 2018; Pilon, 2016; Samuel and Shulman, 2012), and may be a useful diagnostic criterion (Cordelli et al., 2018). Membrane properties also influence important aspects of cancer cells (Nicolson, 2015) and changes in membrane composition correlate with transformation, for example in breast cancer cells (Hilvo et al., 2011; Dória et al., 2012). Indeed, the precise composition of membrane phospholipids influences the activity of many membrane proteins and must often be balanced against possible trade-offs. For example, the levels of omega-3 long-chain polyunsaturated fatty acids (LCPUFAs; i.e. fatty acids of 18 or more carbons and at least two double bonds) are critical for the activity of TRP channels that regulate blood pressure in mammals (Caires et al., 2017) or mechanosensation in the nematode C. elegans (Vásquez et al., 2014). Conversely, these same LCPUFAs are highly prone to peroxidation via Fenton and Haber-Weiss reactions, and therefore represent a liability for the cell (Gaschler and Stockwell, 2017; Ayala et al., 2014; Kelley et al., 2014). Given its central and far-reaching importance, it is surprising that so little is known about the molecular mechanisms that regulate membrane composition and fluidity, a term used throughout this article as a proxy for membrane properties that include fluidity, phase behavior, thickness, curvature, intrinsic curvature and lateral pressure profile (Radanović et al., 2018; Mouritsen, 2011). New or improved methods, such as lipidomic analysis of membrane composition (Löfgren et al., 2016; Ivanova et al., 2009; Ståhlman et al., 2009; Triebl et al., 2017; Jurowski et al., 2017), fluorescence recovery after photobleaching (FRAP) and other methods to measure membrane fluidity in vivo (Maekawa and Fairn, 2014;De Los Santos et al., 2015; Devkota and Pilon, 2018), molecular modelling of membranes (Berkowitz, 2009; Lin et al., 2016; de Vries et al., 2005) and powerful genetic approaches in bacteria, yeast and animals have recently led to the identification of regulators of membrane homeostasis, and elucidation of their mechanism of action. The prototypical fluidity regulator is the prokaryotic DesK protein, which acts as a fluidity sensor that changes conformation depending on membrane thickness, hence switching between its phosphatase and kinase activities and thus regulating its target, a fatty acid desaturase that promotes membrane fluidity when activated (Saita and de Mendoza, 2015; Abriata et al., 2017; Cybulski et al., 2015; Inda et al., 2014). In yeast, the protein Mga2 senses membrane saturation in the endoplasmic reticulum (ER), the site of phospholipid synthesis, via its transmembrane helix, thereby regulating the OLE pathway that promotes fatty acid desaturation (Covino et al., 2016; Ballweg and Ernst, 2017). Similarly IRE1, which is also located in the ER, maintains membrane homeostasis by responding to changes in lipid order (Radanović et al., 2018; Halbleib et al., 2017). Maintenance of membrane homeostasis in animals is especially challenging since their structural fatty acids (FAs) are primarily obtained from a highly variable diet. For example, the nematode C. elegans daily replaces nearly 80% of its membrane phospholipids using mostly dietary fatty acids as building blocks (Dancy et al., 2015). Given the great variation in dietary composition and the narrow membrane composition range optimal for cellular functions, it is evident that robust regulatory mechanisms must exist that adjust FA composition and compensate for dietary variation. 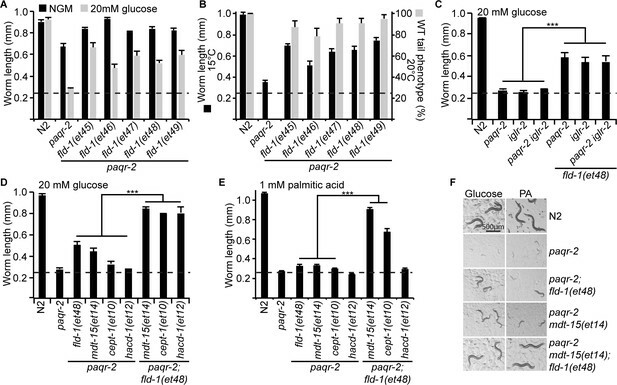 We have previously leveraged the power of forward genetics in the nematode C. elegans to demonstrate that the proteins PAQR-2 and IGLR-2 act as sensors in the plasma membrane that are essential to promote fatty acid desaturation and restore fluidity during cold adaptation or when fed diets rich in membrane-rigidifying saturated fatty acids (SFAs) (Devkota et al., 2017; Svensk et al., 2016a; Svensk et al., 2013; Svensson et al., 2011). Similarly, the human AdipoR1/2 that are homologs of the C. elegans PAQR-2, also regulate membrane fluidity in human cells (Bodhicharla et al., 2018; Devkota et al., 2017). Given the importance of membrane homeostasis, we reasoned that other regulatory pathways likely exist to ensure its robust maintenance. We used forward genetics in C. elegans to isolate novel mutants that suppress the lethality phenotypes of strains with membrane homeostasis defects. Specifically, we performed screens in the paqr-2(tm3410) and iglr-2(et34) mutant backgrounds because these mutants are unable to maintain membrane fluidity when cultivated at low temperatures, which rigidifies membranes, or in the presence of glucose, which is readily converted to SFAs by the dietary E. coli (Devkota et al., 2017; Svensk et al., 2016a). paqr-2(tm3410) mdt-15(et14) double mutants were also screened in an effort to identify novel paqr-2 suppressors that act independently from the desaturases activated by the gain-of-function (gof) mdt-15(et14) allele (Svensk et al., 2013). In all, over 100 000 mutagenized haploid genomes were screened, leading to the isolation of 15 independent mutants that suppress the glucose intolerance of the sensitized strains. The mutants were outcrossed several times to remove unwanted mutations and their genomes sequenced, which revealed eight novel alleles of fld-1 (membrane fluidity homeostasis-1; Figure 1A and Figure 1—figure supplements 1–2), a previously uncharacterized gene; the other mutations affect different genes and remain uncharacterized. Introducing a wild-type fld-1 transgene abolished the suppression, demonstrating that the novel fld-1 alleles are loss-of-function mutations (Figure 1B–D). This was further confirmed using the loss-of-function (lof) fld-1(gk653147) mutant obtained independently by the C. elegans one-million-mutation project (Thompson et al., 2013) and that also suppressed the glucose intolerance of the paqr-2 mutant (Figure 1—figure supplement 3A). Western blot assays using an antibody against a C-terminal peptide show that the FLD-1 protein is absent from the fld-1(et48) mutant (Figure 1—figure supplement 3B). The fact that 8 of the 15 novel mutations that suppress SFA toxicity in sensitized C. elegans backgrounds were alleles of fld-1 suggest that mutating this gene is the easiest genetic mean to prevent this toxicity. Mutant alleles, homology comparisons and expression profile of C.elegans fld-1. (A) Positions and effects of mutant fld-1 alleles; transmembrane domains predicted by Phobius are indicated as blue boxes, and the Pfam PF03798 TLC domain is underlined in green. 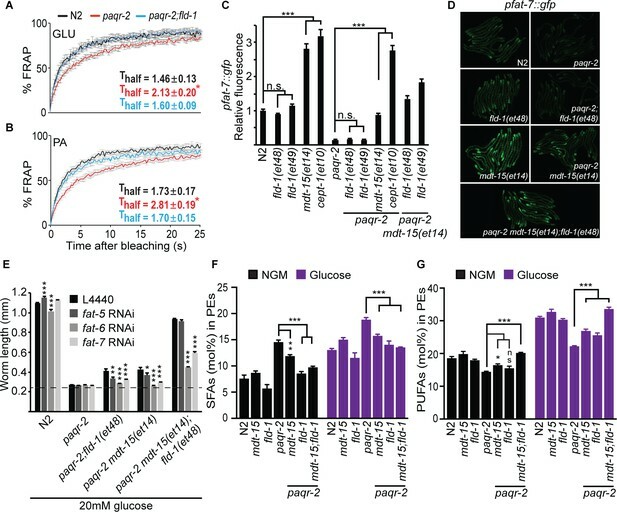 (B–D) Introduction of a wild-type fld-1(+) transgene in control N2 worms has no effect on their growth but restores glucose intolerance in the paqr-2(tm3410);fld-1(et49) double mutant, which shows that fld-1(et49) is a loss-of-function mutation that protects paqr-2 mutant worms from glucose toxicity; transgenic worms are positive for the pharyngeal GFP marker. The dashed line indicates the approximate length of the L1s at the start of the experiment (~250 μm). Note that the experiments involving transgenes were performed separately. (E) Cladogram of the C. elegans (orange shading), D. melanogaster (yellow shading) and human (no shading) proteins homologous to the C. elegans FLD-1 protein (red text and arrow) as per Clustal W. (F) Confocal image of the anterior portion of a fixed C. elegans L1 larva expressing the in vivo translational reporter Pfld-1::FLD-1::GFP. This reporter is ubiquitously expressed in the plasma membrane (green) while the DAPI staining (blue) decorates most of the cytoplasm in each cell since fixation allowed the chromosomal DNA to escape the nucleus. fld-1 encodes a multiple-transmembrane domain protein homologous to the human TLCD1 and TLCD2 proteins (Figure 1E) that belong to a protein family characterized by the presence of a TLC domain and that includes the ER-localized ceramide synthases as well as translocation associated membrane proteins involved in membrane protein synthesis in the rough ER (Pewzner-Jung et al., 2006; Winter and Ponting, 2002). The TLC domain was named after three members of this large protein family (at least 70 homologs) that share sequence homology in their multi-pass transmembrane domain: TRAM (translocating chain-associated membrane protein, important for the translocation of transmembrane proteins during their synthesis in the rough ER), Lag1p (an ER-resident protein that facilitates ER to Golgi transport of glycosylphosphatidylinositol-anchored proteins) and CLN8 (a ubiquitously expressed ER and Golgi-localized protein that causes neurological disorders when mutated) (Winter and Ponting, 2002). The function of TLCD1 and TLCD2 is not known, although TLCD1 (also known as calfacilitin) has been described as a positive regulator of calcium channel activity (Papanayotou et al., 2013). The same study localized TLCD1 to the plasma membrane of mammalian cells using a careful series of myc-epitope tagging and immunodetection experiments (Papanayotou et al., 2013). Transgenic C. elegans carrying a translational GFP reporter (Pfld-1::FLD-1::GFP) reveal that FLD-1 is also expressed in the plasma membrane of most or all cells throughout development and in adults (Figure 1F and Figure 1—figure supplements 3C and 4). Note that the Pfld-1::FLD-1::GFP reporter is functional since it restores the glucose intolerance of the paqr-2(tm3410) mutant (Figure 1—figure supplement 5A–B). Expression of FLD-1::GFP in either hypodermis or intestine was also sufficient to restore the glucose intolerance of the paqr-2(tm3410) mutant, suggesting that fld-1 can act in a variety of tissues (Figure 1—figure supplement 5A and C). This is consistent with an earlier study demonstrating that the maintenance of membrane homeostasis is cell nonautonomous and may rely on effective trafficking of lipids among tissues (Bodhicharla et al., 2018). The fld-1 single mutants have no obvious phenotypes and were indistinguishable from wild-type worms for the following traits: brood size, pharyngeal pumping, locomotion, defecation, survival at 37°C or 30°C, length, UPRer activation scored using the reporter phsp-4::GFP on normal media or in presence of glucose, and life span (Figure 1—figure supplement 6A–I). The only phenotype that we noted in the single fld-1 mutant is an increased activation of the oxidative stress response reporter gst-4::GFP when the worms are cultivated in the presence of the LCPUFA linoleic acid (LA) (Figure 1—figure supplement 6J–L), suggesting a defect in LCPUFA management in the mutant. We also compared five of the novel fld-1 alleles for their ability to suppress three previously described phenotypes caused by membrane homeostasis defects in the paqr-2 mutant, namely glucose intolerance, cold intolerance and a withered tail tip morphology defect (Devkota et al., 2017; Svensk et al., 2016a; Svensk et al., 2013; Svensson et al., 2011; Svensk et al., 2016b). All five tested fld-1 alleles could suppress the three phenotypes to a similar degree, indicating that they are all likely null alleles (Figure 2A–B). The fld-1(et48) allele, which carries a mutation in a splice donor site (Figure 1A), was chosen as the reference allele and used in most subsequent experiments. The fld-1(et48) mutation also suppresses the glucose intolerance of the iglr-2(et34) single mutant and paqr-2(tm3410) iglr-2(et34) double mutant (Figure 2C), as anticipated from the fact that paqr-2 and iglr-2 are mutually dependent for maintenance of membrane homeostasis (Svensk et al., 2016a). There exist four other genes in C. elegans that are closely related to fld-1 (Figure 1E), and null mutants were available for two of them (Y48G8AL.13 and F41H10.5); neither of these mutants suppressed the glucose intolerance of the paqr-2(tm3410) mutant (Figure 1—figure supplement 3D), but both provided some suppression of the cold intolerance defect (Figure 1—figure supplement 3E), suggesting that they may be partially redundant with fld-1. Comparison and genetic interaction of the novel fld-1 alleles with other paqr-2 and iglr-2 suppressors. (A) The five fld-1 alleles tested improve the growth of the paqr-2 mutant on nematode growth media (NGM) and suppressed the paqr-2 growth arrest phenotype on NGM media containing 20 mM glucose. (B) The five fld-1 alleles tested suppressed the 15°C growth arrest and the 20°C tail tip defect phenotypes of the paqr-2 mutant. (C) The reference fld-1(et48) allele suppresses the growth arrest phenotype of paqr-2, iglr-2 and paqr-2 iglr-2 single and double mutants grown on 20 mM glucose. (D) fld-1(et48) greatly enhances the suppression of the growth arrest phenotype of the paqr-2 mutant cultivated on 20 mM glucose by the mdt-15(et14), cept-1(et10) and hacd-1(et12) mutations, which suggest that it acts in a separate pathway. (E) fld-1(et48) greatly enhances the suppression of the growth arrest phenotype of the paqr-2 mutant fed PA-loaded E. coli by the mdt-15(et14) and cept-1(et10) mutations which suggests that it acts in a separate pathway; hacd-1(et12) did not suppress the growth defect on PA-loaded E. coli even when combined with the fld-1(et48) mutation, suggesting that it is a weaker suppressor of paqr-2 mutant phenotypes. (F) Representative images of worms from the experiment in panel (E). The dashed lines indicate the approximate length of the L1s at the start of the experiment (~250 μm). To try and elucidate the mechanism by which fld-1(et48) promotes membrane fluidity, we performed genetic interaction experiments with other paqr-2 suppressors and also analysed the fatty acid composition in these mutants. The fld-1(et48) mutation greatly enhanced the effect of the mdt-15(et14), cept-1(et10) and hacd-1(et12) mutations in supressing intolerance to glucose and, in the case of mdt-15(et14) and cept-1(et10), to the more severe membrane-rigidifying diet of palmitic acid (PA)-loaded E. coli (Figure 2D–F). This result strongly indicates that fld-1(et48) acts in a pathway separate from that of mdt-15 (a mediator subunit), cept-1 (a choline/ethanolamine phosphotransferase) and hacd-1 (a hydroxyl-acyl-CoA dehydrogenase), which promote membrane fluidity by activating FA desaturases (Svensk et al., 2013). In vivo FRAP measurements confirm that the fld-1(et48) allele restores membrane fluidity to paqr-2(tm3410) mutant worms cultivated in the presence of glucose or PA-loaded E. coli (Figure 3A–B), and expression of the desaturase fat-7::GFP reporter was enhanced by mdt-15(et14) and cept-1(et10) but not by fld-1(et48) or fld-1(et49), again showing that fld-1 acts in a separate pathway (Figure 3C–D). Interestingly, RNAi knockdown of the desaturases fat-6 and/or fat-7 abolished the suppression of paqr-2(tm3410) glucose intolerance by fld-1(et48), and this was the case both in the presence or absence of the mdt-15(et14) gof allele (Figure 3E). Knockdown of the desaturase fat-5 also abolished the suppression of paqr-2(tm3410) glucose intolerance by fld-1(et48) but not in the presence of mdt-15(et14) which likely drives sufficient compensatory induction of fat-6 and fat-7. Taken together, these results indicate that fld-1(et48) does not act by promoting increased desaturase expression but that desaturase activity is important for its effect on membrane homeostasis. Phosphatidylethanolamines (PEs) are the most abundant phospholipids in C. elegans (Dancy et al., 2015). An analysis of the PE composition in worms challenged with growth on glucose shows that the paqr-2(tm3410) mutant has an excess of SFAs and reduced levels of LCPUFAs, and that these defects are partially corrected by the mdt-15(et14) or fld-1(et48) mutations, and fully corrected by a combination of both these mutations (Figure 3F–G). The levels of monounsaturated fatty acids (MUFAs) were unchanged in the PEs of the fld-1 mutant, even in combination with the mdt-15(et14) mutation (Figure 3—figure supplement 1A). Similar results were obtained when using PA-loaded E. coli as a rigidifying challenge rather than glucose (Figure 3—figure supplement 1B–C). Note that the lipidomic analysis was performed on whole worms, and thus reflects global lipid composition rather than the composition of any specific membrane; also, cholesterol levels were not measured since this lipid does not appear to play a structural role in C. elegans but instead is a likely precursor for essential low-abundance metabolites (Merris et al., 2004). Altogether, these results are consistent with the fld-1(et48) mutation acting in a pathway independent of mdt-15 to promote LCPUFA levels in phospholipids, at the expense of SFAs, hence increasing membrane fluidity. Some mechanism likely exists to prevent excess membrane fluidity since the fld-1(et48) and mdt-15(et14) mutations do not cause an excess fluidity either by themselves or in combination in any of the tested conditions (Figure 3—figure supplement 2). fld-1(et48) corrects membrane phospholipid composition and several membrane defects of the paqr-2 mutant. (A–B) In vivo FRAP measurements show that fld-1(et48) suppresses the membrane fluidity defect in paqr-2 mutant worms grown on 20 mM glucose or fed PA-loaded E. coli, respectively; note the normalization of the Thalf in paqr-2;fld-1 double mutants. (C–D) The fld-1(et48) and fld-1(et49) mutations do not induce upregulation of the pfat-7::gfp reporter in wild-type or paqr-2 mutant worms; in contrast, the mdt-15(et14) and cept-1(et10) mutations do cause pfat-7::gfp upregulation in both wild-type and paqr-2 mutant worms. The combination of mdt-15(et14) with fld-1(et48) or fld-1(et49) caused a slight increase in pfat-7::gfp in paqr-2 mutants compared to the effect of mdt-15(et14) alone, likely reflecting their improved health (see Figure 2D). (E) RNAi against the Δ9 desaturases fat-6 and fat-7 impairs the suppression of the paqr-2 mutant growth arrest on 20 mM glucose by fld-1(et48), mdt-15(et14) or mdt-15(et14);fld-1(et48); RNAi against fat-5 has a weaker effect. The dashed line indicates the approximate length of the L1s at the start of the experiment (~250 μm). (F–G) The paqr-2 mutant shows an excess of SFAs and reduced LCPUFAs levels among PEs on control plates and 20 mM glucose plates, and this is partially normalized by the mdt-15(et14) and fld-1(et48) single mutations and fully or nearly fully normalized by combining both mutations. Mechanistically, it is possible that the normal function of fld-1 is either to limit the generation of LCPUFA-containing phospholipids or to promote their turnover. In either case, mutations in fld-1 would not only suppress the fluidity defect of the paqr-2 and iglr-2 mutants but may additionally suppress the phenotypes of mutants where the production of PUFAs is inefficient. We tested this using the fat-2 mutant, which is unable to convert 18:1 to 18:2, that is the primary precursor for LCPUFAs in C. elegans (Watts and Ristow, 2017). We found that, indeed, the fld-1 mutation suppresses the growth defect of the fat-2 mutant both on normal plates and plates containing 20 mM glucose, even in a paqr-2(tm3410) mutant background (Figure 3—figure supplement 3A–C). We interpret these results to mean that the fld-1 mutation causes either increased production of LCPUFA-containing phospholipids or lowers their turnover; either effect therefore allows the abundance of LCPUFA-containing phospholipids to reach an increased level in membranes even if their production is reduced by mutations in paqr-2, iglr-2 or fat-2. This interpretation is further supported by the observation that fld-1(et48) can suppress the inability of the paqr-2 mutant to accumulate the exogenously provided LCPUFAs eicosapentaenoic acid (EPA; 20:5) (Figure 3—figure supplement 3D); notably, this demonstrates that no synthesis of LCPUFAs is required for fld-1(et48) to promote their accumulation among phospholipids. The mouse and human TLCD1 and TLCD2 genes are expressed in a variety of tissues, with heart, muscle, liver and fat being strongest for TLCD1 and heart, muscle, liver, small intestine and fat being strongest for the more variably expressed TLCD2 (Fagerberg et al., 2014) (Figure 4—figure supplement 1). The molecular function of these proteins in mammals appears conserved with that of the C. elegans fld-1: knockdown of either gene using siRNA in human HEK293 cells has little effect on these cells under normal conditions (Figure 4—figure supplement 2A–D) but was protective against the membrane rigidifying effects of PA (Figure 4A–B and Figure 4—figure supplement 2E); knockdown of the control gene PPIB had no effect on membrane fluidity (Figure 4—figure supplement 2F–G). Importantly, knockdown of TLCD1 and TLCD2 also protected the HEK293 cells from PA-induced apoptosis (Figure 4—figure supplement 2H–I). The mammalian TLCD1 and TLCD2 proteins regulate membrane composition and fluidity. (A–B) FRAP analysis showing that siRNA against TLCD1 or TLCD2 prevent membrane rigidification by 400 μM PA in HEK293 human cells; note the significantly lower Thalf value in the TLCD1 and TLCD2 siRNA samples. (C) Heat map showing the relative abundance of various FAs in PCs and PEs of HEK293 cells treated with siRNA against TLCD1 or TLCD2 and challenged with 400 μM PA; the data are normalized to the non-target siRNA (NT) average value for each FA. Note the strong increase in several individual LCPUFAs (e.g. 18:2 and 22:6) among PEs in TLCD1 siRNA-treated cells and in LCPUFAs among both PCs (e.g. 18:2, 18:3 and 20:5) and PEs (e.g. 18:2) among TLCD2 siRNA-treated cells. TLCD2 siRNA causes an increased accumulation of EPA in PCs under basal, 400 μM PA-treated or EPA-treated conditions (D), and also in PEs when the HEK293 cells are treated with 0.9 μM EPA (E). (F–G) 1 μM EPA or DHA prevents membrane rigidification by 400 μM PA in HEK293 cells, while 5 μM linoleic acid (LA) is required for the same effect. (H–I) Amount of LA-[13C18] present in PCs and PEs after 6 and 24 hr of incubation, respectively, with cells treated with the indicated siRNA (NT, TLCD1 or TLCD2). (J–K) Knockdown of the desaturase FADS2 reduces the membrane fluidity of HEK293 cells cultivated in 400 μM PA but does not prevent the protective effect of TLCD2 knockdown. Several mechanisms could explain the protective effects of TLCD1/2 knockdown, many of which could be experimentally ruled out. TLCD1 and TLCD2 do not regulate the uptake of exogenous SFAs since there is no difference in the uptake rate of labelled PA in HEK293 cells treated with siRNA against either gene (Figure 4—figure supplement 2J). The SFA content in the TAGs of PA-treated HEK293 cells is also unaffected by TLCD1 or TLCD2 knockdown (Figure 4—figure supplement 2K), as is their TAG/PC ratio (Figure 4—figure supplement 2L) and Nile red staining of lipid stores (Figure 4—figure supplement 2M–N), suggesting no effect on either uptake or sequestering of FAs. The expression levels of the desaturases SCD and FADS1-3 are also not increased by TLCD1 or TLCD2 knockdown (Figure 4—figure supplement 2O) ruling this out as a mechanism for the fluidizing effect; indeed, the SCD expression is downregulated in TLCD1 or TLCD2 knockdown which may reflect a decreased demand on their activity. The most likely mechanisms of action for TLCD1/2 is that they either act by limiting the production of LCPUFA-containing phospholipids or by promoting their turnover, thus echoing our speculations regarding FLD-1 function in C. elegans. This conclusion is supported by the marked increase in the abundance of the 18:2, 20:5 and 22:6 LCPUFAs in the PEs of TLCD1 knockdown cells, and of the 18:2, 18:3 and 20:5 LCPUFAs in the PCs of TLCD2 knockdown cells (Figure 4C). No other major changes were observed in the lipid profiles of TLCD1/2 knockdown cells. Specifically, there were no large differences in the FA composition of PCs or PEs under normal conditions (Figure 4—figure supplement 3A–B), in the PC/PE ratio and cholesterol content under basal or PA-challenged conditions (Figure 4—figure supplement 3C–D), or in the ceramide levels which were dramatically increased upon cultivation in PA (Figure 4—figure supplement 3E–H). Note that, as in C. elegans, the lipidomic analysis was performed on whole cells, and thus reflects global lipid composition rather than the composition of any specific membrane. Cultivating HEK293 cells in the presence of exogenous EPA leads to its excess accumulation in PCs and PEs when TLCD2 is knocked down (Figure 4D–E), which demonstrates that, as in C. elegans, de novo PUFA synthesis is not required for the TLCD2 effect on PUFA-containing phospholipids; no change in TAG storage or EPA storage in TAGs occurred upon TLCD2 knockdown, indicating that TLCD2 does not regulate fatty acid storage or LCPUFA uptake (Figure 4—figure supplement 3I–J). The effect of TLCD2 knockdown on phospholipid EPA levels is especially interesting since LCPUFAs are very potent fluidizing lipids (Yang et al., 2011), which we confirmed experimentally in our cell system where as little as 1 μM of EPA or docosahexaenoic acid (DHA) prevents membrane rigidification by 400 μM PA (Figure 4F–G). Note that caution should be taken when quantitatively interpreting these types of experiments since the uptake, metabolism, incorporation, subcellular localization and turnover of the lipids being compared may differ substantially. We then considered whether the TLCDs may act by limiting the generation of LCPUFA-containing phospholipids or by promoting their turnover. To distinguish between these two hypotheses, we incubated HEK293 cells in the presence of the 13C-labeled LCPUFA LA (18:2) and monitored its incorporation and clearance rate in control cells or cells where either TLCD1 or TLCD2 had been knocked down. The results show that TLCD2 knockdown caused increased incorporation of LA in PCs and PEs within 6 hr of incubation, and that increased incorporation was also evident by 24 hr in the PEs of TLCD1 and TLCD2 knockdown cells (Figure 4H–I). No obvious differences were observed in the TLCD1/2 knockdown cells during the chase part of the experiment (Figure 4—figure supplement 3K–L). 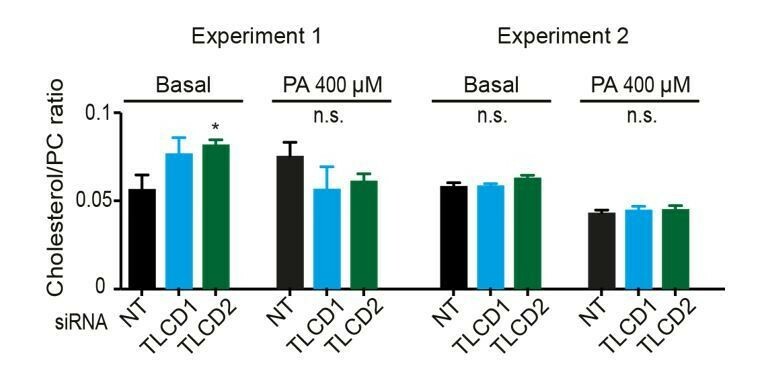 Altogether, these results indicate that the primary function of TLCD1 and TLCD2 is to limit the formation of LCPUFA-containing phospholipids rather than promote their turnover. Finally, we further confirmed functional conservation between C. elegans FLD-1 and mammalian TLCD1/2 in several ways. Firstly, we found that TLCD2 siRNA protects against the potentiated rigidifying effects of PA when the FADS2 desaturase is knocked down (Figure 4J–K; Figure 4—figure supplement 3M), just as the fld-1 mutation suppressed the effects of the fat-2 mutation in C. elegans; this also strengthens the conclusion that TLCD2 acts independently from the desaturases. We also found that TLCD2 knockdown suppresses membrane rigidification in HEK293 cells where AdipoR2 had been knocked down, which by itself increases the sensitivity to the effect of PA on membrane rigidification (Devkota et al., 2017) (Figure 5A–B; Figure 5—figure supplement 1A). This again echoes the C. elegans findings where fld-1 lof mutations suppress the membrane rigidity phenotype of the paqr-2 mutant. As noted earlier, TLCD2 knockdown causes a strong increase in the levels of EPA in PCs (Figure 4C), which is a potent fluidizing LCPUFA: 5 μM are sufficient to completely protect AdipoR2 knockdown cells from the rigidifying effects of 200 μM PA (Figure 5C). TLCD2 knockdown also suppresses the composition defect in HEK293 cells where AdipoR2 had been knocked down: TLCD1 and TLCD2 siRNA both improved the UFA content of PCs and PEs in AdipoR2 knockdown cells treated with 200 μM PA (Figure 5D–E), and also normalized ceramide levels in these cells (Figure 5—figure supplement 1B–E). TLCD2 knockdown protects against AdipoR2 knockdown. 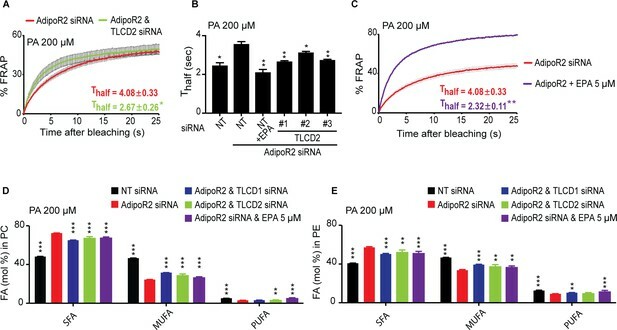 (A–C) FRAP analysis showing that siRNA against TLCD2 or inclusion of 5 μM EPA protects against the rigidifying effects of 200 μM PA in cells where AdipoR2 is also knocked down. Note the significantly lower Thalf value in the TLCD2 siRNA and EPA-treated samples. (D–E) AdipoR2 siRNA causes an excess of SFAs and depletion of MUFAs and PUFAs in the PCs and PEs of HEK293 cells; these effects of AdipoR2 knockdown are partially abrogated by siRNA against TLCD2 or by the inclusion of 5 μM EPA. The fatty acid composition of cellular membranes reflects the composition of the dietary fats. This is especially evident for complex dietary PUFAs that become incorporated into membrane phospholipids in C. elegans (Dancy et al., 2015) and in mammals (Pan and Storlien, 1993; Abbott et al., 2012; Andersson et al., 2002). However, regulatory mechanisms must exist to adjust membrane composition, hence properties, in response to diets with a wide range of SFA/UFA ratios. The present study shows that fld-1 in C. elegans, and TLCD1/2 in mammalian cells, potentiate the toxicity of exogenous SFAs, and act by limiting the generation of LCPUFA-containing phospholipids (see the model in Figure 6). The net result of mutations in fld-1 or knockdown of TLCD1/2 is therefore an increase in LCPUFA-containing phospholipids, which helps maintain membrane fluidity in the presence of exogenous SFAs. In particular, LCPUFAs, which are present in elevated levels in the worm fld-1 mutant and in human HEK293 cells with knockdown of either TLCD1 or TLCD2, are potent membrane fluidizers, as we have shown here (Figure 4F–G and Figure 5C) and in agreement with other studies (Yang et al., 2011). Hence, a small increase in LCPUFAs can greatly increase membrane fluidity. Updated model of membrane fluidity regulation in C. elegans. Loss of membrane fluidity, which may result from lowered temperature or SFA-rich diets, is sensed by the PAQR-2/IGLR-2 complex that then signals to promote FA desaturation, hence restoring fluidity; lof and gof mutations in the genes labelled in red and green, respectively, can act as paqr-2/iglr-2 suppressors (Devkota et al., 2017; Svensk et al., 2016a; Svensk et al., 2013). 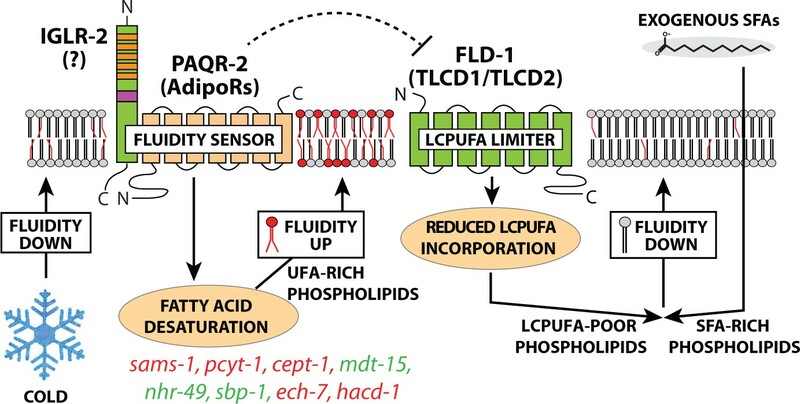 The present study shows that an alternative route to promote membrane fluidity is to inhibit FLD-1, for example by mutation, which results in reduced turnover of LCPUFA-containing phospholipids, hence allowing their accumulation. The names of mammalian homologs for PAQR-2 and FLD-1 are indicated in parenthesis; the mammalian homolog of IGLR-2 is not yet identified. The possibility that PAQR-2 regulates FLD-1 (dashed line) is suggested by the fact that lof mutations in fld-1 suppress paqr-2 mutant phenotypes; there is at present no evidence for physical interactions. Structurally, the FLD-1 and TLCD1/2 proteins are characterized by the presence of a TLC domain and are therefore distantly related to the ER-localized ceramide synthases (human CERS1-6) and to the translocation associated membrane proteins (human TRAM1, TRAM2 and TRAM1L1) involved in membrane protein synthesis in the rough ER (Pewzner-Jung et al., 2006; Winter and Ponting, 2002). Other TLC domain-containing proteins exist (see Figure 1B) but their function remains unclear, though some are suggested to act in lipid sensing, transport or synthesis (Winter and Ponting, 2002). In contrast to the CERSs and TRAMs, FLD-1 and TLCD1/2 are localized to the plasma membrane rather than in the ER (Figure 1F and Figure 1—figure supplement 4) (Papanayotou et al., 2013). This, and the fact that they lack critical motifs, indicate that FLD-1 and TLCD1/2 are neither ceramide synthases nor translocation associated proteins. Instead, their localization and effect on PUFA content in membrane phospholipids suggest that they act at the level of the plasma membrane by limiting the amounts of LCPUFA-containing phospholipids. It is possible, for example, that FLD-1 and TLCD1/2 influence substrate selection by phospholipases or lysophospholipid acyltransferases, that is regulating the Lands cycle through which phospholipids are actively remodelled by fatty acid exchange and hence effectively influence membrane composition and properties (Shindou et al., 2017). In particular, the presence of several membrane-bound acyl transferases in C. elegans suggest a promising avenue of genetic interaction studies to test their possible connection to FLD-1 activity (Matsuda et al., 2008; Lee et al., 2008). Note however that the plasma membrane localisation of FLD-1 and TLCD1/2 makes a direct control of lysophospholipid acyltransferases, which are believed to localize in internal membranes, notably the ER, rather unlikely. The type of LCPUFAs that are elevated in the C. elegans fld-1 mutant and in HEK293 treated with siRNA against TLCD1/2 could have other effects besides influencing membrane fluidity. In particular LCPUFAs can serve as precursors for many signalling lipids (Funk, 2001; Watts, 2016). That fld-1 has its primary effects on membrane fluidity is however supported by several lines of evidence, much of which hinges on the fact that fld-1 mutants act as paqr-2 and iglr-2 suppressors. This is important because the paqr-2 and iglr-2 mutants clearly have membrane fluidity defects since: a) They are sensitive to membrane-rigidifying conditions (cold or exogenous SFAs); b) Their mutant phenotypes are suppressed by other mutations that promote an increase in fluidizing UFAs, by exogenous UFAs or by fluidizing amounts of mild detergents (NP-40 or Triton X-100); c) The paqr-2 and iglr-2 mutants have an excess of membrane-rigidifying SFA-containing phospholipids; and d) The paqr-2 and iglr-2 phenotypes are closely associated with reduced membrane fluidity measured in vivo using FRAP under numerous different experimental conditions or genotypes (Devkota et al., 2017; Svensk et al., 2016a; Svensk et al., 2013; Svensson et al., 2011). Similarly, siRNA against AdipoR2 causes an increase in phospholipid SFAs and reduced membrane fluidity in the presence of exogenous palmitate as determined using FRAP or the Laurdan dye method, and siRNA against TLCD1/2 suppresses this membrane fluidity defect. The effect of TLCD1/2 on plasma membrane composition likely explains the published observations that TLCD1 facilitates the activity of calcium channels that are essential during neural plate development (Papanayotou et al., 2013). Indeed, membrane composition can have strong effects on a variety of processes including insulin secretion by beta cells (MacDonald et al., 2015), glucose transport (Ginsberg et al., 1982), endocytosis (Krischer et al., 1993; Illinger et al., 1991), regulation of metabolic rate (Hulbert and Else, 2000), platelet aggregation (Winocour et al., 1990) and TRPV channel activity (Caires et al., 2017). Conversely, given the chemical instability of PUFAs, which are readily peroxidized (Gaschler and Stockwell, 2017; Ayala et al., 2014; Kelley et al., 2014; Catalá, 2013), it seems natural for cells to have mechanisms that limit their levels. Indeed, we found that the C. elegans fld-1 mutant exhibits an enhanced oxidative stress response when challenged with the LCPUFA LA (Figure 1—figure supplement 6J–L), which indicates a function for fld-1 in preventing such PUFA-derived oxidative stress. The ubiquitous plasma membrane expression of C. elegans fld-1 suggests that it functions in most cells, though it is not required under non-challenging conditions given the relative health of the mutant. 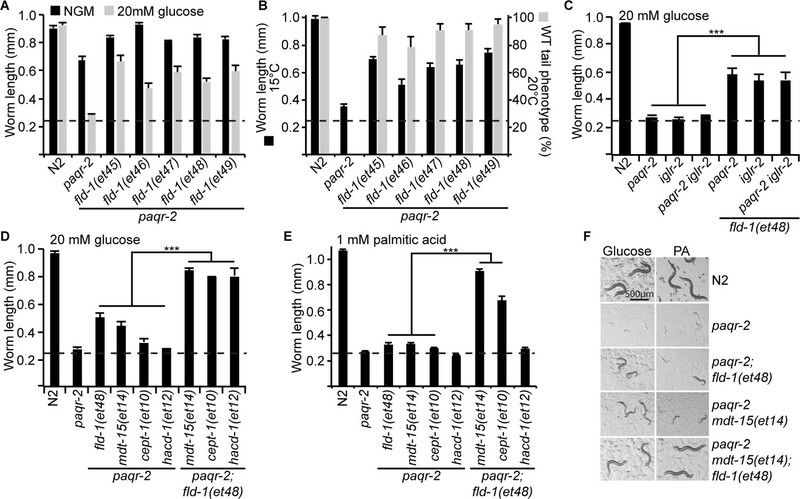 The present work further establishes that a function of paqr-2 and iglr-2 in C. elegans is to prevent SFA lipotoxicity, and specifically to prevent membrane rigidification by SFAs, and further suggests that they may act via two separate pathways: 1) Upregulation of desaturases to promote membrane fluidity; and 2) Inhibition of fld-1 directly or of a fld-1-regulated pathway. This conclusion is supported by the existence of two classes of paqr-2 suppressors: mutations that activate desaturases (e.g. gof mutations in nhr-49 or mdt-15, and lof mutations in sams-1, cept-1, pcyt-1, ech-7 or hacd-1) (Svensk et al., 2013) and loss-of-function mutations in fld-1, which does not act by upregulating desaturases though it depends on their activity (present work). The suggestion that paqr-2 may influence fld-1 activity is raised only as a possibility consistent with the observed genetic interactions; we have at present no biochemical evidence that these proteins interact with each other nor do we know of a mechanism by which paqr-2 could regulate fld-1. We propose that inhibitors of TLCD1/2 may have therapeutic potential in instances of lipotoxicity and excess membrane rigidity, which is a feature of the diabetic condition (Pilon, 2016; Perona, 2017), or in instances of mutations in AdipoR1 that cause retina defects (Zhang et al., 2016; Rice et al., 2015). Encouragingly, we found that the fld-1 C. elegans single mutant has no obvious phenotype, which suggests that inhibition of the mammalian homologs may be well tolerated. at 1:500 dilution for Western blot. The wild-type C. elegans reference strain N2 and the mutant alleles studied are available from the C. elegans Genetics Center (CGC; MN; USA). The pfat-7::GFP (rtIs30) carrying strain HA1842 was a kind gift from Amy Walker (Walker et al., 2011), and its quantification was performed as previously described (Svensk et al., 2013). The C. elegans strains maintenance and experiments were performed at 20°C using the E. coli strain OP50 as food source, which was maintained on LB plates kept at 4°C (re-streaked every 6–8 weeks) and single colonies were picked for overnight cultivation at 37°C in LB medium then used to seed NGM plates (Sulston and Methods, 1988); new LB plates were streaked every 3–4 months from OP50 stocks kept frozen at −80°C. NGM plates containing 20 mM glucose were prepared using stock solution of 1 M glucose that was filter sterilized then added to cooled NGM after autoclaving. For experiments involving the mutant fat-2(wa17), worms were maintained using the nt1 balancer which balances the right half of LG IV; gravid hermaphrodites were bleached and the synchronized non-balanced progeny were scored for the growth. paqr-2(tm3410), iglr-2(et34) or paqr-2(tm3410) mdt-15(et14) worms were mutagenized for 4 hr by incubation in the presence of 0.05 M ethyl methane sulfonate (EMS) according to the standard protocol (Sulston and Methods, 1988). The worms were then washed and placed on a culture dish. Two hours later, vigorous hermaphrodite L4 animals were transferred to new culture plates. Five days later, F1 progeny were bleached, washed and their eggs allowed to hatch overnight in M9 (22 mM KH2PO4, 42 mM Na2HPO4, 85.5 mM NaCl and 1 mM MgSO4). The resulting L1 larvae were transferred to new plates containing 20 mM glucose then screened 72 hr later for fertile adults, which were picked to new plates for further analysis. The isolated suppressor alleles were outcrossed 4-to-6 times prior to whole genome sequencing (see below), and 10 times prior to their phenotypic characterization or use in the experiments presented here. The genomes of suppressor mutants were sequenced to a depth of 25-40x as previously described (Sarin et al., 2008). Differences between the reference N2 genome and that of the mutants were sorted by criteria such as non-coding substitutions, termination mutations, splice-site mutations, etc. (Bigelow et al., 2009). For each suppressor mutant, one or two hot spots, that is small genomic area containing several mutations, were identified, which is in accordance to previous reports (Zuryn et al., 2010). Mutations in the hot spot that were still retained after 10 outcrosses were considered candidate suppressors and tested experimentally as described in the text. Stocks of 0.1 M palmitic acid (Sigma) dissolved in ethanol, 3.1 M EPA (Sigma) or 3.24 M LA (Sigma) were diluted in LB media to final concentrations of 0.25–2 mM, inoculated with OP50 bacteria, then shaken overnight at 37°C. The bacteria were then washed twice with M9 to remove fatty acids and growth media, diluted to equal OD600, concentrated 10X by centrifugation, dissolved in M9 and seeded onto NGM plates lacking peptone (200 µl/plate). Worms were added the following day. For length measurement studies, synchronized L1s were plated onto test plates seeded with E. coli, and worms were mounted then photographed 72 hr or 96 hr later (as indicated). The length of >20 worms was measured using ImageJ (Ballweg and Ernst, 2017; Ginsberg et al., 1982). Quantification of the withered tail tip phenotype was done on synchronous 1 day old adult populations, that is 72 hr post L1 (n ≥ 100) (Svensk et al., 2013). Other assays starting with 1 day old adults have also previously been described in details: total brood size (n = 12) (Svensson et al., 2011), lifespan (n = 5) (Svensson et al., 2011), defecation period (n = 5; average interval between five defecation was determined for each worm) (Liu and Thomas, 1994), pharyngeal pumping rate (n = 10, each monitored for 20 s) (Axäng et al., 2007), speed (n = 10) (Tajsharghi et al., 2005), survival at 30°C and 37°C (n = 20) (Zevian and Yanowitz, 2014) and expression levels of zcIs4(phsp-4::GFP) (Rauthan et al., 2013). Oxidative stress was analyzed in N2 and fld-1 worms using CL2166 (dvIs19 [(pAF15)gst-4p::GFP::NLS] III (Link and Johnson, 2002). Synchronized gst-4::GFP and fld-1; gst-4::GFP worms were spotted on control plates and 40 mM LA plates. After 72 hr of incubation at 20°C, worms were mounted on agarose padded slides. Images were taken using Carl Zeiss high magnification microscope. Identical settings and exposure time was used for all the conditions. Quantitative measurements of the GFP intensity was performed on synchronized 1 day old adults using Image J (n ≥ 20). FRAP experiments in C. elegans were carried out using a membrane-associated prenylated GFP reporter expressed in intestinal cells, as previously described and using a Zeiss LSM700inv laser scanning confocal microscope with a 40X water immersion objective (Devkota et al., 2017; Svensk et al., 2016a). Briefly, the GFP-positive membranes were photobleached over a circular area (seven pixel radius) using 20 iterations of the 488 nm laser with 50% laser power transmission. Images were collected at a 12-bit intensity resolution over 256 × 256 pixels (digital zoom 4X) using a pixel dwell time of 1.58 μsec, and were all acquired under identical settings. For FRAP in mammalian cells, HEK293 cells were stained with BODIPY 500/510 C1, C12 (4,4-Difluoro-5-Methyl-4-Bora-3a,4a-Diaza-s-Indacene-3-Dodecanoic Acid) (Invitrogen) at 2 μg/ml in PBS for 10 min at 37°C (Devkota et al., 2017). FRAP images were acquired with an LSM880 confocal microscope equipped with a live cell chamber (set at 37°C and 5% CO2) and ZEN software (Zeiss) with a 40X water immersion objective. Cells were excited with a 488 nm laser and the emission between 493 and 589 nm recorded. Images were acquired with 16 bits image depth and 256 × 256 resolution using a pixel dwell of ~1.34 μs. At least ten (n ≥ 10) pre-bleaching images were collected and then the region of interest was beached with 50% of laser power. The recovery of fluorescence was traced for 25 s. Fluorescence recovery and Thalf were calculated as previously described (Svensk et al., 2016a). Videos of FRAP experiments are provided as supplementary material (Figure 4 –videos 1-3). Crowded plates of various C. elegans strains were harvested and washed twice in M9 and then lysed using the following lysis buffer: 25 mM Tris (pH 7.5), 300 mM Nacl, 1% triton X-100 and 1X protease inhibitor. Total of 100 μg and 25 μg (for transgenic worms) of protein was loaded in each lane. For detection of the FLD-1 protein, rabbit antiserum was generated by immunizing a rabbit against the peptide TQVGDVESGPLRTQ corresponding to C terminal amino acids (GeneScript). The nitrocellulose membranes (GE Healthcare) were blocked with 5% skimmed milk diluted in TBST. Antibody dilutions (primary antibody: (1:500) and secondary antibody: (1:2500)) and washes were carried out in TBST. Detection was performed using an ECL detection kit (Millipore), as per the manufacturer´s instructions. The Pfld-1::fld-1 rescue construct was created using the primers 5’- agattttgaggcttttctgtggg −3’ and 5’- gcagctgcctcatttgttga −3’ to amplify the fld-1 gene and 2 kb of upstream regulatory sequence using N2 worm genomic DNA as template. The resulting 6.7 kb PCR product was cloned into the pCR XL-TOPO vector using TOPO XL PCR cloning kit (Invitrogen). The assembled plasmid was injected into N2 worms at 10 ng/μl together with 3 ng/μl pPD118.33 (Pmyo-2::GFP), a gift from Andrew Fire (Addgene plasmid # 1596); (Davis et al., 2008). The fld-1 translational GFP reporter was generated with a Gibson assembly cloning kit (NEB) by assembly of the following 2 DNA fragments: (1) The fld-1 promoter and fld-1 coding sequence was amplified from the fld-1 rescuing plasmid with the following primers: 5’-ggcatggatgaactatacaaatagactcaccccgccgctcccccaattgt-3’ and 5’- aacagtttgtgtcgcgtcttctgttgttccatgaatcgtttgcactccga-3’, (2) GFP was amplified from the plasmid Ppaqr-2:paqr-2:GFP (Svensson et al., 2011) using the primers 5’- cagaagacgcgacacaaactgttatgagtaaaggagaagaact-3’ and tgtaatcc cagcagctgttacaa-3’. The resulting Pfld-1::FLD-1::GFP plasmid was injected into N2 worms at 10 ng/μl together with the plasmid 30 ng/μl PRF4, which carries the dominant rol-6(su1006) marker (Mello et al., 1991). The fld-1 hypodermis-specific transgene was constructed using a Gibson assembly cloning kit (NEB) with the following DNA fragments: (1) 2 kb upstream regulatory sequences from elt-3 amplified from N2 genomic DNA using the primers 5’- cgccagtgtgctggaattcgccctttgtgacacgttgtttcacggtcatc-3’ and 5’- tcaacagctccgccagctgccgcatccgagcttgctgagatggctggaca-3’ and (2) the fld-1 coding sequence with GFP was amplified from the plasmid fld-1 translational GFP reporter using primers 5’- atgcggcagctggcggagct-3’ and 5’- aagggcgaattccagcacac-3’. The assembled plasmid was injected into N2 worms at 10 ng/μl together with 3 ng/μl pPD118.33. Intestine-specific transgene was constructed using Gibson assembly cloning kit (NEB) by assembly of the following 2 DNA fragments: (1) 2 kb upstream regulatory sequences from ges-1 was amplified from N2 genomic DNA using the primers 5’- ccgccagtgtgctggaattcgcccttaatattctaagcttaatgaagttt-3’ and 5’- tcaacagctccgccagctgccgcatctgaattcaaagataagatatgtaa-3’, (2) The fld-1 coding sequence with GFP was amplified from the plasmid fld-1 translational GFP reporter using primers 5’- atgcggcagctggcggagct-3’ and 5’- aagggcgaattccagcacac-3’. The assembled plasmid was injected into N2 worms at 10 ng/μl together with 3 ng/μl pPD118.33. For worm lipidomics, samples were composed of synchronized L4 larvae (one 9 cm diameter plate/sample; each treatment/genotype was prepared in five independently grown replicates) grown overnight on OP50-seeded NGM, NGM containing 20 mM glucose or plates lacking peptone but seeded with fatty acid-supplemented bacteria. Worms were washed 3 times with M9, pelleted and stored at −80°C until analysis. For HEK293 lipidomics, cells (prepared in at least three independent replicates) were cultivated in serum-free media with or without fatty acids for 24 hr prior to harvesting using TrypLE Express (Gibco). For lipid extraction, the pellet was sonicated for 10 min in methanol and then extracted according to published methods (Löfgren et al., 2012). Internal standards were added during the extraction. Lipid extracts were evaporated and reconstituted in chloroform:methanol [1:2] with 5 mM ammonium acetate. This solution was infused directly (shotgun approach) into a QTRAP 5500 mass spectrophotometer (Sciex, Toronto, Canada) equipped with a Nanomate Triversa (Advion Bioscience, Ithaca, NY) as described previously (Jung et al., 2011). Phospholipids were measured using multiple precursor ion scanning (Ejsing et al., 2009; Ekroos et al., 2003). Ceramides from HEK293 cells were measured using ultra performance liquid chromatography coupled to tandem mass spectrometry according to previous publication (Amrutkar et al., 2015). Free cholesterol from HEK293 cells was quantified using straight phase HPLC coupled to ELS detection according to previous publication (Homan and Anderson, 1998). The data were evaluated using the LipidView software (Sciex, Toronto, Canada). The complete lipidomics dataset is provided as source data files associated with the figures. Six isoflurane-anesthetized C57BL/6 mice (Charles River) were terminated (14–16 P.M.) and organs were collected, weighed and snap frozen in liquid nitrogen for further storage at −80°C. Total RNA extraction was done using TRIzol LS (ThermoFisher Scientific) on all tissues along with a RNeasy Mini Kit or RNeasy Fibrous Mini Kit for fiber-rich tissues (heart and skeletal muscle) according to manufacturer’s instructions (Qiagen). Quantification was done using a NanoDrop spectrophotometer (ND-1000; ThermoFisher Scientific) with quality cut-off set at >1.8 for both A260/A280 and A260/A230 before synthesizing cDNA using a High Capacity cDNA Reverse Transcription Kit (Applied Biosystem) with random hexamers. qPCR was executed in triplicates on a QuantStudio7 Flex Real-Time PCR System (ThermoFisher Scientific) using a TaqMan Gene Expression Master Mix (ThermoFisher Scientific) and TaqMan Gene Expression Assays for all genes: TLCD1 (Mm00503356_g1), TLCD2 (Mm01240453_g1). PPIA (Mm02342430_g1) was used to normalize for RNA input variation. FAM fluorophore with MGB was used as probe. All genes were measured in separate wells in technical triplicates but on the same plate, and with at least three independent biological samples for each tissue. The relative gene expression was calculated as 2(-ΔΔCt) using the lowest expressing tissue as reference tissue as described elsewhere (Livak and Schmittgen, 2001). All mice experimental work was approved by the local ethics review committee on animal experiments (Gothenburg region). HEK293 (identify verified by STR profiling and tested free of mycoplasma) were grown in DMEM containing glucose 1 g/l, pyruvate and GlutaMAX and supplemented with 10% fetal bovine serum, 1% non-essential amino acids, HEPES 10 mM and 1% penicillin and streptomycin (all from Life Technologies) at 37°C in a water humidified 5% CO2 incubator. Cells were sub-cultured twice a week at 90% confluence. Cells were cultivated on treated plastic flask and multi-dish plates (Nunc). For FRAP experiments, HEK293 were seeded in glass bottom dishes (Ibidi) pre-coated with 0.1% porcine gelatin (Sigma). Millicell EZ slides (Millipore) were used for Nile red staining. The following pre-designed siRNAs were purchased from Dharmacon: AdipoR2 J-007801–10, Non-target D-001810–10, PPIB D-001820–10, TLCD1 J-015483–10, TLCD2 J-180826–09 (#1) J-180826–16 (#2) and J-180826–17 (#3). Transfection of 25 nM siRNA was performed in complete media using Viromer Blue according to the manufacturer’s instructions 1X (Lipocalyx). Knockdown gene expression was verified 48 hr and/or 72 hr after transfection. Total cellular RNA was isolated using RNeasy Kit according to the manufacturer’s instructions (Qiagen) and quantified using a NanoDrop spectrophotometer (ND-1000; Thermo Scientific). cDNA was obtained using a High Capacity cDNA Reverse Transcription Kit (Applied Biosystem) or a RevertAid H Minus First Strand cDNA Synthesis Kit with random hexamers. qPCR were performed with a CFX Connect thermal cycler (Bio Rad) using Hot FIREpol EvaGreen qPCR SuperMix (Solis Biodyne) and standard primers. Samples were measured as triplicates. The relative expression of each gene was calculated according to the ΔΔCT method (Livak and Schmittgen, 2001). Expression of the housekeeping gene PPIA was used to normalize for variations in RNA input. Primers used were: AdipoR2-For (TCATCTGTGTGCTGGGCATT) and -Rev (CTATCTGCCCTATGGTGGCG), FADS-1-For (TGGCTAGTGATCGACCGTAA) and –Rev (GGCCCTTGTTGATGTGGAAG), FADS-2-For (GGGCCGTCAGCTACTACATC) and –Rev (ACAAACCAGTGGCTCTCCAG), FADS-3-For (AATCTGGCGTACATGCTGGT) and –Rev (AAGAGGTGGTGCTCGATCTG), PPIA-For (GTCTCCTTTGAGCTGTTTGCAG) and -Rev (GGACAAGATGCCAGGACCC), PPIB-For (AGATGTAGGCCGGGTGATCT) and –Rev (GCTCTTTCCTCCTGTGCCAT), SCD-For (TTCGTTGCCACTTTCTTGCG) and –Rev (TGGTGGTAGTTGTGGAAGCC), TLCD1-For (TGGCACAACCTGCTCGTC) and –Rev (CACGATGTCCACCGTATCGT), TLCD2-For (TGGCTGTGTCTGTGGGTTAC) and –Rev (AGCAGGCAGAGTTCAGTTCC). Changes in gene expression were measured in n ≥ 3 biological independent experiment, including internal technical triplicates. PA, LA, EPA and DHA were dissolved/diluted in sterile DMSO (Sigma) then mixed with fatty acid-free BSA (Sigma) in serum-free medium for 15 min at room temperature. LA-[13C18] in DMSO solution was obtained from IsoSciences and used at 50 μM. The molecular ratio of BSA to PA was 1 to 5.3 (except in the experiment using 200 μM PA in which case the ratio was 1 to 2.65). Cells were then cultivated in this serum-free media containing the fatty acids for 24 hr prior to analysis, unless stated otherwise. Cells were detached with TrypLE Express (Gibco), washed and resuspended in Annexin V binding buffer (BD Bioscience). Then, cells were stained with FITC-Annexin V and 7-ADD according manufacturer’s instructions (BD Bioscience) and analyzed in a FACS Canto II (BD Bioscience) flow cytometer. Data were analyzed with FlowJo X. Early apoptotic cells were defined by Annexin V+ and 7-ADD−. Apoptotic cells were measured in three independent experiments. Cells were treated with [9,10-3H(N)]-Palmitic Acid (Perkin Elmer) at a specific activity of 0.5 μCi and 100 μM cold PA in 0.5% BSA. After 10, 30 or 60 min of incubation, the cells were washed with PBS, resuspended and the activity measured with a TRI-CARB 4810TR 110 V Liquid Scintillation Counter (Perkin Elmer). Fatty acid uptake inhibitor phloretin (Sigma) was dissolved in DMSO. When phlotetin was used, cells were pre-treated for 15 min and the concentration kept constant at 200 μM. Staining was carried out in fixed cells (3.7% formaldehyde, 20 min). The dye was added directly to the fixed cells to a final concentration of 100 ng/ml and incubated for 30 min. The dye was washed out using PBS prior to microscopy. Hoescht3458 was added to visualize cell nuclei. Fluorescence signal was captured with a Zeiss Axio Scope.A1 microscope and AxioVision 4.7.2 software. Images were automatically quantified with Image J software. Except for the scoring of the worm tails, error bars show the standard error of the mean, and t-tests were used to identify significant differences between treatments. Error bars for the frequency of the tail tip defect show the 95% confidence interval and significant differences were determined using Z-tests. t-tests were used to determine significance in FRAP experiments, and when comparing lipidomics data. Asterisks are used in the figures to indicate various degrees of significance, where *: p<0.05; **: p<0.01; and ***: p<0.001. All quantitative experiments were performed with a minimum of three independent biological replicates (see individual Materials and methods), meaning that populations of worms or cells were independently grown and analysed. All quantitative experiments, with the exception of some lipidomics experiments, were also entirely performed at least twice with similar results. The exceptions were single runs of the following lipidomics experiments (each run included at least four independent biological replicates): LA-[13C18] experiment in Figure 4H–I and Figure 4—figure supplement 3K-L.
Biochimica Et Biophysica Acta (BBA) - Biomembranes 1818:1309–1317. Accounts of Chemical Research 50:1359–1366. The American Journal of Clinical Nutrition 76:1222–1229. Oxidative Medicine and Cellular Longevity 2014:1–31. Biochimica Et Biophysica Acta (BBA) - Biomembranes 1788:86–96. Computer Methods and Programs in Biomedicine 162:263–271. Journal of Bioenergetics and Biomembranes 21:115–135. Molecular Reproduction and Development 82:587–604. The Journal of Physical Chemistry B 109:11643–11652. Breast Cancer Research and Treatment 133:635–648. Journal of Lipid Research 44:2181–2192. Biochemical and Biophysical Research Communications 482:419–425. Biochimica Et Biophysica Acta (BBA) - Biomembranes 690:157–164. Journal of Chromatography B: Biomedical Sciences and Applications 708:21–26. Annual Review of Physiology 62:207–235. Biology of the Cell 71:293–296. Current Opinion in Chemical Biology 13:526–531. Biochimica Et Biophysica Acta (BBA) - Molecular and Cell Biology of Lipids 1811:925–934. Critical Reviews in Analytical Chemistry 47:418–437. Mary Ann Liebert, Inc. 140 Huguenot Street, 3rd Floor New Rochelle, NY 10801 USA 12:403–415. Molecular Biology of the Cell 19:1174–1184. The Journal of Physical Chemistry B 120:11930–11941. The Journal of Neuroscience 14:1953–1962. Journal of Lipid Research 53:1690–1700. American Society for Biochemistry and Molecular Biology 290:11075–11092. Journal of Cell Science 127:4801–4812. J Lipid Res. American Society for Biochemistry and Molecular Biology 45:2044–2051. The Royal Society of Chemistry 13:19195–19205. The Journal of Nutrition 123:512–519. Biochimica Et Biophysica Acta (BBA) - Biomembranes 1859:1690–1703. J Biol Chem. American Society for Biochemistry and Molecular Biology 281:25001–25005. Lipids in Health and Disease 15:167. Biochimica Et Biophysica Acta (BBA) - Biomembranes 1848:1757–1764. American Society for Biochemistry and Molecular Biology 292:12054–12064. Journal of Chromatography B 877:2664–2672. Cold Spring Harbor: Cold Spring Harbor Laboratory Press. Biochimica Et Biophysica Acta (BBA) - Molecular and Cell Biology of Lipids 1862:740–746. Journal of Clinical Medicine 5:19. Diabetes. American Diabetes Association 39:241–244. TRAM, LAG1 and CLN8: members of a novel family of lipid-sensing domains? Trends in Biochemical Sciences 27:381–383. Thank you for submitting your article "Membrane Fluidity is Regulated by the C. elegans Transmembrane Protein FLD-1 and its Human Homologs TLCD1/2" for consideration by eLife. Your article has been reviewed by three peer reviewers, and the evaluation has been overseen by a guest Reviewing Editor and a Senior Editor. The following individual involved in review of your submission has agreed to reveal their identity: Robert Ernst (Reviewer #2). Two other reviewers remain anonymous. All three reviewers have provided detailed and thoughtful reviews, and we have included the separate reviews below for your consideration. Overall the reviewers were in broad agreement about the interest of the work and the high quality and compelling nature of the genetic analysis. They also identified a number of weaknesses that they felt needed to be addressed prior to publication. In particular the evidence for the localisation of FLD-1 and its mammalian orthologs, and the effects of the mutations on the levels of cholesterol needs to be addressed more clearly. In addition they felt that your description of what the data show and the citation of the literature need to be more accurate, and some of the statistical analysis needs to be improved. These seem the key points, but the more minor points they make also seem valid and hopefully most can be addressed by changes to the text. If you can address all of the reviewers' points, and provide a point-by-point description of your revisions, then I would be happy to consult them again to ask if the paper is now of acceptable quality. The authors conduct an extensive genetic approach in worms to characterize the FLD-1 protein and then performed experiments with mammalian cells to study the FLD-1 homologues, TLCD1 and TLCD2. Together with careful lipidomics data and measurements of plasma membrane dynamics by FRAP experiment, this study suggests that these mysterious transmembrane proteins prevent excessive incorporation of polyunsaturated acyl chains into phospholipids, notably PE and PC. When these proteins are deleted or silenced, PUFAs incorporation is increased, which can protect cells from the rigidification effect of lipid saturation (e.g. under the presence of glucose or at low temperature). Although the exact molecular activities of TLCD1/2 and FLD-1 remains unknown, this study is very original and the data are compelling. As this family exists in many organisms, the work should interest a wide audience. 1) Plasma membrane localization of FLD1. This localization is inferred from confocal images using a GFP construct (Figures 2F and Figure 1—figure supplement 4). I notice that the cells shown in Figure 2F have a prominent nucleus, making the cytoplasm volume minimal. Therefore, I'm not entirely convinced that the protein is at the plasma membrane. Wouldn't a protein present in the cortical ER give a similar localization pattern? This is important because, functionally, the localization of FLD1 at the plasma membrane is puzzling considering that lipid synthesis and remodeling is believed to occur mostly in internal membranes (notably ER). How can FLD1 affects fatty acid incorporation into phospholipids if the protein is not in the same membrane as lysophospholipid acyl transferases? See also my remark on the mammalian proteins. 2) The genetic characterization in Figures 2 and 3 is extensive and compelling, showing a clear rescue effect of various fld-1 mutants on the defects induced by temperature or glucose on the growth and morphology of worm mutants for the PAQR-2 and/or IGLR-2 proteins. The genetic interactions tested in Figures 2D-F and 3E suggest that FLD-1 acts by a pathway different from the previously described pathway, which relies on the overexpression of a FA desaturase. Instead, they suggest a genetic interaction with the desaturases fat-6 or fat-7 (please comment on the lack of interaction with fat-5; Figure 3E). How about acyl transferases e.g. MBOA-6? 3) Related to the previous point. At least in text or perhaps through further genetic studies, the authors should try to connect their work with recent studies on the families of acyltransferases responsible for the incorporation of fatty acids with defined level of unsaturation (e.g. PMID:28578316 and others studies by the Shimizu group), as well as on recent attempts to better characterize the molecular properties of polyunsaturated phospholipids in membranes (e.g. Pinot et al., 2014 for endocytosis). 4) The lipidomic analysis on the acyl chain profile performed on phosphatidylethanolamine is also compelling. Under glucose, the paqr-2 mutant accumulates saturated PE at the expense of polyunsaturated PE, an effect that is inverted by the further introduction of the fld-1 mutation, notably in combination with mutation of the mdt-15 gene. The data under conditions of a saturated diet (Figure 3—figure supplement 1B-D) are also impressive. The authors, however, might mention that the plasma membrane accounts for only a minor part of the total cellular membranes. Therefore, it is unlikely that the plasma membrane is the only one to be affected in its acyl chain profile. The lipidomic analysis is performed on cells or tissues, not on plasma membrane, which is technically much more demanding. 5) For mammalian cells, would it be possible to further study the sub-localization of the FLD-1 homologues (TLCD1 and TLCD2). 6) I am not sure I understood the experiments shown in Figure 4—figure supplement 2O and the associated conclusion. Is there an effect of silencing TLCD1 or TLCD2 on desaturases expression? The running title is: TLCD1/2 limit LCPUFAs. It should be TLCD1/2 limit LCPUFA incorporation. This genetic study describes the identification of an important modulator of the membrane lipid composition in C. elegans and human cells. Building on previous work by the same group, in which the plasma membrane-localized PAQR-2 and IGLR-2 proteins have been identified as an important modulators of fatty acid desaturases, the authors used genetic screens in paqr-2 and iglr-2 mutant backgrounds to identify other regulatory factors. The genetic evidence for fld-1 being an important suppressor of paqr-2 mutant variants employing a distinct mechanism is very convincing. Furthermore, the authors present data that fld-1 is ubiquitously expressed in plasma membranes and that fld-1 mutant alleles suppress a series of membrane-related defects observed in paqr-2 cells, but do not seem to affect membrane properties and membrane-related phenotypes in a wildtype background. The phenotypes include membrane fluidity (as tested by FRAP experiments), worm length, and the acyl chain composition of membrane lipid. Lipidomic analysis provides strong evidence that fld-1 limits the level of long chain polyunsaturated membrane lipids and that fld-1 mutants increase it. Knockdown experiments of the mammalian TLCD1 and TLCD2 proteins identify similar effects on the membrane lipid composition and membrane fluidity in HEK293 cells stressed by palmitic acid provided with the medium. 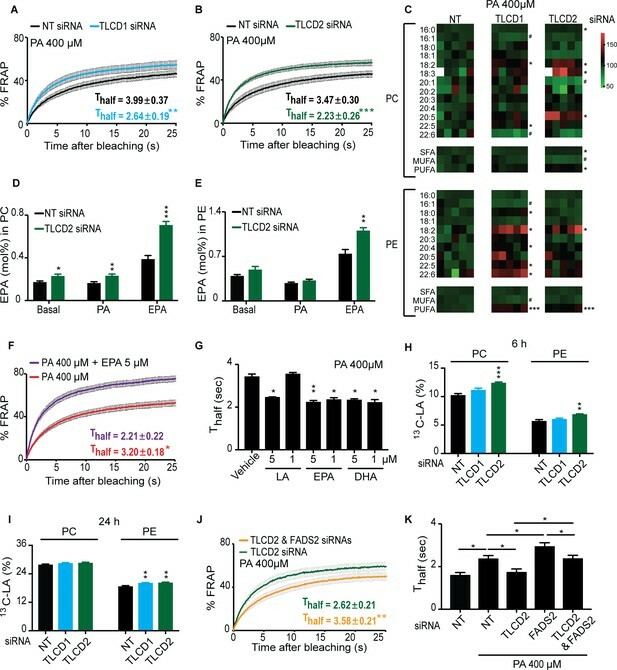 Pulse-labeling experiment suggest that the production/formation of polyunsaturated acyl chain-containing lipids is increased in fld-1 mutants thereby leading to the conclusion that fld-1 is a key regulator of polyunsaturated lipid homeostasis. Without any doubt, this manuscript identifies fld-1 and TLCD1/2 as important contributors to membrane homeostasis in C. elegans and human cells. The technical quality and presentation of the data is very good. The conclusions of the manuscript are justified and provide an important, new link for a better understanding of membrane lipids in health and disease. After a revision of the manuscript based on the points discussed below, I can recommend this manuscript for publication in eLife. Even though the number of weaknesses outnumbers the number of strengths, I consider this manuscript as an excellent study with potentially very high impact on a much broader scientific community in the future. Strength 1: This manuscript represents a thorough genetic dissection of the pathways involved with membrane homeostasis paired with an extensive phenotypic characterization including lipidomic analyses. Strength 2: The technical quality of the data is very high and support the conclusions of the authors. Strength 3: The authors provide compelling and carefully controlled data from two distinct model systems: C. elegans and human cells. Weakness 1: The literature referenced in the Introduction and Discussion does often not suit the purpose. Many papers referred to in the text report correlative observations, but are cited in way to make a statement. Only few studies mentioned in the text provide the original, clear-cut, biochemical or biophysical studies for the point being made. In some instances, there seems to be a discrepancy between the cited reference and the statement made in the text. This must be improved. Weijers, 2016: The role of membrane 'flexibility' on microcirculation does not become clear to the reader. The term 'flexibility' lacks a clear physical definition. Weijers, 2012 is a review article with similar content as Weijers, 2016, while other highly influential references such as (e.g. PMID: 22385956) or original literature linking the membrane lipid composition to diabetes are missing. Taraboletti et al., 1989 and Sherbet, 1989 do not justify the statement that defects in membrane are hallmarks of cancer. Taraboletti et al., 1989 provides only a correlative argument, while the Abstract of Sherbet, 1989 even states 'Steady-state fluorescence polarization […] does not suggest marked differences in bulk 'fluidity' of metastatic variant'. Fecchio, Palazzi and de Laureto, 2018 primarily discusses the folding of α-synuclein in the presence of high concentration of free polyunsaturated fatty acids and in the absence of cellular membranes. This is not a suitable model to imply functions of PUFAs in neurodegenerative diseases. The role of α-synuclein in interacting with cellular membranes and regulating vesicular traffic is not being discussed at all in this context. Other recent studies, which suggest important roles in specific polyunsaturated lipids in membrane deformation (PMID:25104391), domain stability (PMID: 27119640), membrane fission events (PMID: 29543154). Potential players important for mediated the regulated production/conversion of membrane lipids in fld-1 cells are not discussed (PMID: 18782225; PMID: 18094042; PMID: 7174678). I suggest that the authors carefully revisit their list of references used in the Introduction and the Discussion. Weakness 2: The concept of membrane fluidity is highly prevalent in biology and serves as a wonderful descriptor of membrane biophysics, which is also intuitively understood by a broader readership. However, I do not find any clear evidence in this manuscript (nor in the cited references) that membrane fluidity is indeed the critical factor in the context of the observed phenotypes. The role of lipids containing polyunsaturated fatty acids has gained increasing attention in the past years (see below) and the authors could do a better job in highlighting these developments in light of their data. The authors should clearly indicate that membrane fluidity is used as a readily available descriptor of a membrane property. A separate paragraph should discuss that also other membrane properties are greatly affected by lipids with polyunsaturated fatty acid chains and that it is not clear, which of these membrane properties are most relevant for the observed phenotypes observed in genetic experiments. Weakness 3: The important role of FLD-1 and TLCD1/2 is being established, but the potential targets of FLD-1 and TLCD1/2 are neither discussed, nor is there any speculation on how a signal from FLD-1 or TLCD1/2 might be transmitted to regulate the production/formation of very long chain polyunsaturated lipids. The authors should provide some more insight in how the communication between the plasma membrane bound proteins and their effector functions is being established. A direct regulation of FLD-1 by PAQR-2 is indicated in Figure 6, but I cannot find evidence that supports this speculation. Do the authors suggest a direct regulation or rather an indirect one via the fluidity (or other properties) of the plasma membrane? How can a plasma membrane embedded protein send a signal that affects the incorporation of polyunsaturated fatty acids into lipids? Does it signal go to the ER, to the nucleus, or to the plasma membrane? Is there any indication for a transcriptional response or for a signaling molecule/second messenger/post-translational modification that might transmit the signal to other proteins involved in establishing the fatty acyl chain composition of membrane lipids? Does, for example, knockdown of TLCD1/2 lower the activity of the unfolded protein response in response to palmitate? This would indicate that the lipid composition in the ER membrane is affected FLD-1 mediated regulation and not only the plasma membrane. What is the connection to cholesterol? An important factor contributing to membrane fluidity and membrane phase behavior of cellular membranes in mammals is cholesterol. Especially because cholesterol has key functions in organizing the plasma membrane of mammalian cells (but not C. elegans), and because SREBP proteins are central regulators of many aspects of lipid metabolism, it would be important to see if and how TLCD1/2 affects the cholesterol level and cholesterol signaling in these cells. For HEK cells and C. elegans different approaches have been undertaken. Does incubation at 37 °C of the BODIPY 500/510 for 10 min result in an uptake of the dye to inner membranes? In order words: do the FRAP data refer to FRAP in the plasma membrane or is it due to internal membranes? The authors should provide a confocal image that shows incorporation of the dye in the plasma membrane and no strong labeling of intracellular membranes. Furthermore, the authors should use a GPI-anchored protein to measure the effect of FLD-1 and/or TLCD1/2 on proteins on the extracellular leaflet of the plasma membrane. General: The number of individual data points should be provided with the experiments and with the appropriate statistical tests. Subsection “fld-1 is ubiquitously expressed in plasma membranes”: The TLC (TRAM, LAG1,and CLN8) domain should be introduced better – otherwise it may remain unclear to many readers what TRAM, LAG1, and CLN8 stand for. Subsection “fld-1 acts in a pathway distinct from other paqr-2 suppressors”: 'PA' is used as an abbreviation for palmitic acid, but introduced only later in the paragraph. Moreover, the abbreviation may be misleading, as the paper refers to phosphatidylethanolamine as PE, and PA might be misunderstood as phosphatidic acid. Maybe the authors find a less confusing way to refer to palmitic acid? Subsection “fld-1 acts in a pathway distinct from other paqr-2 suppressors”: the mdt-15 and cept-1 mutant worms are mentioned without further explanation of their putative functions. This might be confusing for a reader not familiar with C. elegans. – Subsection “Mammalian TLCD1 and TLCD2 are regulators of membrane composition and fluidity”, second paragraph and Figure 4—figure supplement 2OFigure: The expression level of SCD is substantially reduced, but this observation is not discussed in the manuscript (only in the figure legend). Does this indicate that there are substantial changes in the lipid composition of the endoplasmic reticulum under these conditions, which lead to a distinct regulation of SCD? The notion that 'as little as 1 µM of EPA or DHA […] prevents membrane rigidification by 400 µM PA' should be avoided. It does not make sense to compare these concentrations, because the uptake, metabolism, incorporation in different lipids, their subcellular localization, and turnover might differ substantially between these fatty acids. Just comparing the concentration in the media does not make sense. Subsection “Mammalian TLCD1 and TLCD2 are regulators of membrane composition and fluidity”, last paragraph: (as above) Comparing the concentration of LCPUFA necessary to protect cells from 200 µM PA is not relevant, given the complexity of the metabolic steps involved. Discussion, first paragraph: (similar as above): The expression 'fifty times more potent' is misleading and should be omitted. The cited reference (Yang et al., 2011) does not warrant equal metabolism of LCPUFAs and oleic acid in cells. This statement would ignore, that different fatty acids have remarkable distinct abundancies in the cellular membrane. The statement does not define in what respect LCPUFAs are more potent? How is it being measured? Of note, the effect of different lipids on collective bilayer properties are not linear. For these reasons, the authors should avoid a quantitative comparison of the effects by different fatty acids. Discussion, second paragraph: The authors list a number of processes that seem to be affected by the membrane lipid composition. However, the true underlying mechanism remain entirely unexplored in these studies. Also, membrane microdomains are mentioned here for the first time in the manuscript. This of course has many implications on the interpretation of the FRAP experiments (see below). I would recommend not to go into a discussion on the modulatory role of the membrane composition, but instead focus more on the discussion how FLD-1 and/or TLCD1/2 might excerpt their modulatory function. Discussion, third paragraph: It is unclear to me, how the presented data suggest a direct, regulatory role of PAQR-2 and IGLR-2 on FLD-1. The proteins might act independently. However, if PAQR-2 and IGLR-2 would modulate FLD-1 function – what would be the signal? Figure 2C: The most interesting statistical test should be performed between worms with the fld-1 allele and without it. As mentioned in the previous comments, it would help if the number of experiments (n) would be provided with the experiments. We have the read the manuscript 'Membrane fluidity is regulated by the C. elegans transmembrane protein FLD-1 and its human homologs TLCD1/2' by Ruiz et al. In this study the authors have performed a suppressor screen for paqr (adiponectin receptor homolog) and iglr (adiponectin interacting protein) mutants that show increased membrane rigidity at low temperature or when grown in presented on high glucose. They identified several alleles of this gene were capable of suppressing the growth and morphological defects observed in the two mutants. They show that fld-1 mutants, under conditions of stress (cold/high glucose/or feeding of saturated fatty acid) continue to favor a membrane composition that is slightly higher in unsaturated fatty acids thus increasing its fluidity. They have demonstrated similar abilities for human homologs of this protein in tissue culture studies. 1) Suppressor screen and identification of genetic interactors of PAQR/Adiponectin receptor. 2) Detailed genetic studies of paqr/iglr/fld-1/and other previously isolated suppressors of paqr/iglr. 3) Efforts to extend the original findings in C.elegans to human homologs in tissue culture experiments. 4) Lipidomic correlation of morphological defects with increased saturated fatty acid content in membrane lipids (this is not new finding but extension of authors' findings in earlier studies). 5) General concurrence between C. elegans and human data. 1) No biochemical function for FLD-1/TLCD1-2 has been elucidated in this study. The manuscript begins as a genetic interaction study and remains as such despite valiant efforts by the authors to describe the interactions using numerous experiments and extending the studies to human homologs of FLD-1. 'We isolated C. elegans mutants with improved tolerance to dietary saturated fat, including eight alleles of the novel gene fld-1 that encodes ahomolog of the human TLCD1 and TLCD2 transmembrane proteins. FLD-1 is localized on plasma membranes and mutants have an excess of highly membrane-fluidizing long-chain polyunsaturated fatty acid-containing phospholipids that results in improved membrane fluidity as measured in vivo using fluorescent recovery after photobleaching (FRAP)'. The mutants do not show notable phenotypes or deviations from normal under regular growth conditions, at least from what can be inferred from data observed in the figures and by the authors' own admission while describing the phenotypic characterization of the mutants. The mutants do not show improved tolerance to saturated fat on their own and do not have an excess of membrane-fluidizing LCPUFA ordinarily but only under stress conditions. They show improved tolerance only in the presence of other mutations. 3) Since the molecular function of FLD-1 has not been elucidated it leads to a conceptual dilemma in the working hypothesis proposed by the authors. The authors argue that FLD-1/TLCD1-2 is a plasma membrane protein that decreases the incorporation of LCPUFA to the membrane implying a function in the immediate vicinity of plasma membrane (thus cell autonomous). Yet in Figure 1—figure supplement 5C, they show transgenic expression of FLD-1 in hypodermis or intestine is sufficient to restore glucose sensitivity on paqr-fld-1 double mutant indicating a cell non-autonomous role. 4) The data shows that in the absence of these proteins, there is an increase in incorporation of LCPUFA's within 6 hours, indicating that the deacylation-reacylation cycle (Lands cycle) may be involved. Is it possible that FLD-1/TLCD1/TLCD2 interact with membrane phospholipases or Acyl-CoA:lysopospholipid acyltransferases and modulate their function? 1) Figure 3E-G the dashed line needs to be included. 2) Figure 4—figure supplement 3. Legend refers to '(R-S) Knockdown of the desaturase FADS2 reduces the membrane fluidity ofHEK293 cells cultivated in 400 μM PA but does not prevent the protective effect of TLCD2 knockdown'. These figures seem to be missing. 3) Figure 2A-B: The fld-1(et45) shown as single mutant but it should be fld-1(et45); paqr-2 double mutant? 4) Subsection “fld-1 acts in a pathway distinct from other paqr-2 suppressors”: typo error fld-1(et34) it should be fld-1(et48). 5) It is not clear why SDs have been used in some analyses and SEM for others? 1) A specific point raised in the decision letter regards the localization of the FLD-1 protein. There is no doubt that the in vivo FLD-1::GFP reporter is localized to the plasma membrane of most and perhaps even all cells in C. elegans at all developmental stages. We now provide an additional Figure 1—figure supplement 4A panel which shows confocal imaging of this reporter on a non-fixed living worm where it is very clear that all plasma membranes are GFP-positive while very little/no GFP expression is found in the cytoplasm. We have retained Figure 1F because it includes DAPI staining even though this requires fixation which causes some deformation of the morphology. However, we have rephrased the figure legend as follows: “Confocal image of the anterior portion of a fixed C. elegans L1 larva expressing the in vivo translational reporter Pfld-1::FLD-1::GFP. This reporter is ubiquitously expressed in the plasma membrane (green) while the DAPI staining (blue) decorates most of the cytoplasm in each cell since fixation allowed the chromosomal DNA to escape the nucleus.” The mammalian homolog TLCD1 was carefully localized to the plasma membrane in mammalian cells using immunofluorescence detection of a series of MYC-epitope tagged constructs. We now explicitly mention this as follows: “The same study localized TLCD1 to the plasma membrane of mammalian cells using a careful series of myc-epitope tagging and immunodetection experiments (Papanayotou et al., 2013)”. 2) A second point raised concerns the effects of the mutations on the level of cholesterol, which we were asked to address more clearly. We have measured the relative abundance of free cholesterol versus phosphatidylcholine (cholesterol/PC ratio) in control cells and TLCD1/2 siRNA-treated cells with or without palmitate challenge. No changes of note were detected and this information is provided in Figure 4—figure supplement 4D, where the y-axis has been more clearly labelled “cholesterol/PC ratio” rather than the previous “FC/PC ratio”. Note that the lipidomics provided in Figure 4—figure supplement 6 all come from the same experiments, which allows direct comparisons. In Author response image 1 we provide the results from two experiments in which the cholesterol/PC ratios were measured. No changes in cholesterol were detected in the second experiment. We therefore feel confident in our statement that differences in cholesterol content do not explain the effects of TLCD1/2 knockdown on membrane properties (subsection “Mammalian TLCD1 and TLCD2 are regulators of membrane composition and fluidity”, third paragraph). 3) Also as requested in the cover letter, and by the reviewers, we have thoroughly revised the literature cited both in the Introduction and in the Discussion, and in particular raised the possibility that the FLD-1/TLCDs proteins may influence membrane composition by regulating the Lands cycle by which phospholipids can be remodelled (specific changes are detailed below). Several improvements to our descriptions of the data and statistics have also been made. The “n” for each method used is clearly stated in the Materials and methods, and we also added a statement about repeats of entire experiment (subsection “Statistics”). Concerns plasma membrane localization of FLD-1 and the mammalian homologs. See answer to decision letter, point 1. The reviewer asks that we discuss the possible involvement of acyltransferases as targets of FLD-1/TLCDs. We have now done so in the Discussion: “It is possible, for example, that FLD-1 and TLCD1/2 influence substrate selection by phospholipases or lysophospholipid acyltransferases, i.e. regulating the Lands cycle through which phospholipids are actively remodelled by fatty acid exchange and hence effectively influence membrane composition and properties (Pan and Storlien, 1993; Abbott et al., 2012; Andersson et al., 2002; Shindou et al., 2017). 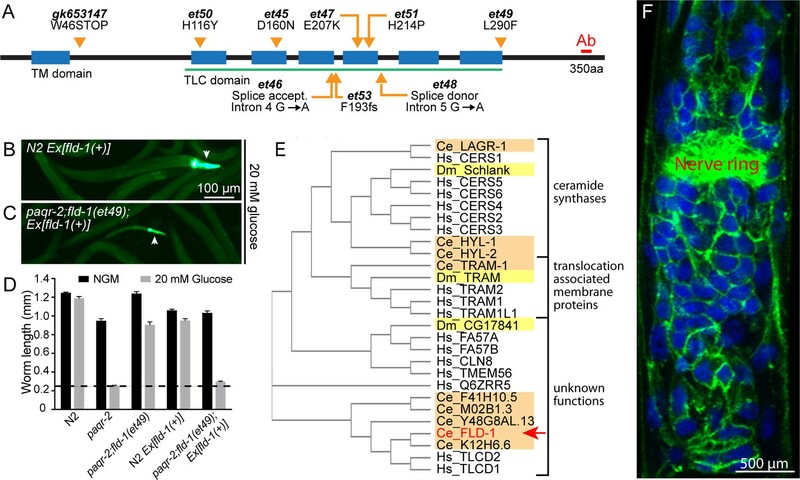 In particular, the presence of several membrane-bound acyl transferases in C. elegans suggest a promising avenue of genetic interaction studies to test their possible connection to FLD-1 activity (64,65).” Also, the work by Pinot et al. is now cited in the Introduction (Pinot et al., 2014). Concerns the localization of the TLCDs. See answer to decision letter, point 1. […] Without any doubt, this manuscript identifies fld-1 and TLCD1/2 as important contributors to membrane homeostasis in C. elegans and human cells. The technical quality and presentation of the data is very good. The conclusions of the manuscript are justified and provide an important, new link for a better understanding of membrane lipids in health and disease. After a revision of the manuscript based on the points discussed below, I can recommend this manuscript for publication in eLife. The reviewer urged us to reconsider the literature cited in the Introduction and Discussion, and made several suggestions for improvement. The references in the first paragraph of the Introduction have been updated to include more primary research articles, and now include the reviewer’s suggestions which were all spot on. Similarly, the second paragraph of the Discussion now brings up phospholipases/acyltransferases (Lands cycle) as a possible regulatory point for FLD-1/TLCDs (see reviewer 1, point 3). At the reviewer’s suggestion, we now introduce “fluidity” as a convenient term alluding to a complex phenomenon: “Given its central and far-reaching importance, it is surprising that so little is known about the molecular mechanisms that regulate membrane composition and fluidity, a term used throughout this article as a proxy for membrane properties that include fluidity, phase behavior, thickness, curvature, intrinsic curvature and lateral pressure profile (Radanović et al., 2018; Mouritsen, 2011).” Additionally, we now include a new paragraph in the Discussion (third paragraph) that serves two purposes: mention the possible roles of LCPUFAs as precursors to signaling molecules, and reviews the evidence that fld-1 actually acts through its effects on membrane properties. The reviewer asks that we examine the effect of TLCD1/2 knockdown on cholesterol levels. See the response to decision letter, point 2 (above). The reviewer asks for clarifications about how the FRAP experiments are performed, especially regarding the use of BODIPY 500/510 C1, C12 to label membranes in mammalian cells. The reviewer is quite right: inner membranes are also labelled under our experimental conditions and are monitored in the FRAP experiments. We now provide an image to make that quite clear (Figure—figure supplement 2B and legend), as well as videos of three FRAP experiments (Figure 4—figure supplements 3-5: control siRNA, and TLCD2 siRNA with and without 400 μM palmitate). The TLCD domain is more clearly introduced (subsection “fld-1 is ubiquitously expressed in plasma membranes”). The abbreviation PA for palmitic acid is clarified at its first instance (subsection “fld-1 acts in a pathway distinct from other paqr-2 suppressors”). Information about mdt-15 and cept-1 is now provided (subsection “fld-1 acts in a pathway distinct from other paqr-2 suppressors”). Subsection “Mammalian TLCD1 and TLCD2 are regulators of membrane composition and fluidity”, second paragraph and Figure 4—figure supplement 2O: The expression level of SCD is substantially reduced, but this observation is not discussed in the manuscript (only in the figure legend). Does this indicate that there are substantial changes in the lipid composition of the endoplasmic reticulum under these conditions, which lead to a distinct regulation of SCD? Changes in SCD expression are now mentioned in the text (see reviewer 1, point 6). We have been much more cautious in describing the potency of LCPUFA supplements (subsection “Mammalian TLCD1 and TLCD2 are regulators of membrane composition and fluidity”, fourth paragraph; Discussion, first paragraph). We removed mention of microdomains. As mentioned earlier, the possibility of an interaction between PAQR-2 and FLD-1 is mentioned only as a possibility consistent with the genetics (see reviewer 2, point 3). The statistical test is done/shown for Figure 2C. n for each experiment is stated in the Materials and methods section for each method. We also added a statement about repeats of entire experiment (subsection “Statistics”). The reviewer raises the issue that we still do not know the biochemical function of FLD-1/TLCDs. This is true and was discussed in the answer to reviewer 2, point 3. Possible connections to the Lands cycle are now mentioned in the Discussion (second paragraph). See also answer to reviewer 1, point 3 and reviewer 2, point 3. The dashed line has been added to Figure 3E (it is not needed in 3F-G). Legend to Figure 4—figure supplement 3 has been corrected. The labels in Figure 2A-B have been fixed. The typo has been fixed: it is fld-1(et48). SEM is used throughout except when scoring the tail tip defects, which is a “Normal/Abnormal” scoring and for which the 95% confidence is indicated. affiliated with AstraZeneca. The author has no other competing interests to declare. We thank the Center for Cellular Imaging at the University of Gothenburg for microscopy support. Some C. elegans strains were provided by the Caenorhabditis elegans Genetics Center, which is funded by the NIH Office of Research Infrastructure Programs (P40 OD010440). We also thank Svenja Mende, Vilma Canfjorden and Rebecka Persson for their help with some of the experiments. Funding: Cancerfonden, Vetenskaprådet, Carl Tryggers Stiftelse, Diabetesfonden, Swedish Foundation for Strategic Research, Kungliga Vetenskaps-och Vitterhets-Samhället i Göteborg, Lundgrens Stiftelse and Tore Nilssons Stiftelse. There are no competing interests. All data are available in the manuscript or the supplementary materials. © 2018, Ruiz et al.